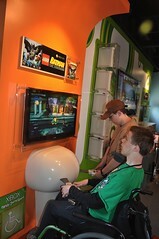 Mik loves playing the Xbox at home, although he is not that much into the LEGO games. Last time we went to Legoland he did not want to check out the Xbox Family Game Space, but this time he let us check it out. 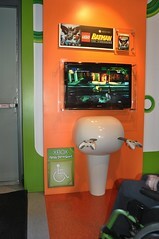 It is pretty nicely set up with two game stations that are wheelchair accessible. Also, the Lego Rock Band area does not have seats, so while not meant just for wheelchairs it works for those in wheelchairs other than the drums having a foot pedal. Overall very wheelchair accessible and fun considering no rides at Legoland are wheelchair accessible. However, kind of a disappointment that it had one of the screens set up for Batman instead of LEGO Star Wars (best LEGO adventure video games in my opinion). At least there were two options, though, with the other screen having LEGO Harry Potter.